BBC News is reporting this evening that Nelson Mandela has died. Mandela was imprisoned in 1962, having been convicted of sabotage and conspiracy to overthrow the white-minority government of South Africa. According to The Raw Story, he remained on a US terror watch list until 2008, and was once described by late British Prime Minister Margaret Thatcher as the leader of a terrorist organization (The African National Congress). But that is not his legacy. 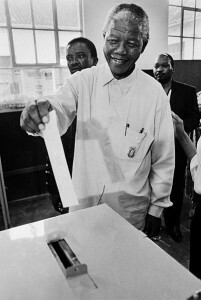 After his 1990 release, Mandela worked closely with the South African government to negotiate a peaceful end to apartheid and establish racially inclusive elections. 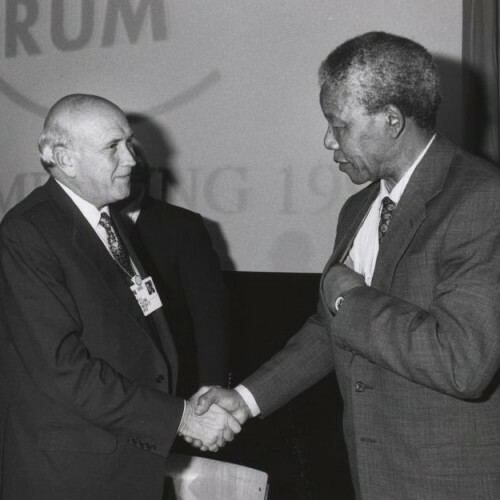 According to Fox News, in 1993 he and President Frederik Willem De Klerk were jointly awarded the Nobel Peace Prize and in 1994, at the age of 75, he was inaugurated as the first black president of South Africa. Today, Nelson Mandela is a figure whose legacy unites leaders around the world, from all ends of the political spectrum. In the United States, upon news of his death, Speaker of the House of Representatives John Boehner called Mandela an unrelenting voice for democracy, a testament to enduring faith in God and respect for human dignity, and a champion of peace and racial harmony. Senate Majority Leader Harry Reid tweeted: In a way, Mandela was both the “George Washington” and “Abraham Lincoln” of his country. We’re so fortunate to have lived in his time. And President Barack Obama called him a man who took history in his hands and bent the arc of the moral universe towards justice. Both in his personal story, and in what he has come to mean to people around the world, Nelson Mandela illustrates the triumph of civility. And we here grieve for his loss.